Our goal is to connect people with the best local experts. We scored wedding photographers on more than 25 variables across five categories, and analysed the results to give you a hand-picked list of the best wedding photographers in Santa Cruz, CA. Adriane White Photography started in 2012 in Santa Cruz, CA. The owner and photographer, Adriane White, specializes in wedding photography. She also accepts requests for engagement and portrait photography. She serves clients in Santa Cruz, Bay Area, Monterey, Carmel, and beyond. Ms. White earned her Bachelor of Arts degree in 2004 from the University of California, Santa Cruz (UCSC) with a focus on Photography. She worked as a second shooter for seven years before putting up her private studio. Her signature style is quiet and fun, combining both the classic and candid moments to capture the authenticity of the images on the couples’ most important day. Adriane’s prices range from $3,000-$4,999 for weddings and $375 for engagement sessions. Wedding albums that start at $575 and videography packages are also available. Adriane White Photography is featured in several online and print publications about weddings and was named best photographer in the Best of Santa Cruz Pros in the Good Times newspaper. Blake Weber Photography is a photography company in Santa Cruz, California, established in 2013. They specialize in fine art wedding photography and also offers engagement photography. Blake Weber will turn his client’s love story into a work of art through his camera. Whether people are looking back at their albums 1 year after or even 50 years later, these photos will make them feel what it is like reliving those moments. Blake Weber Photography is featured on Offbeat Bride and has been a Wedding Wire rated business. Blake Weber Photography has also been a recipient of the award recognition from the Wedding Wire Couples’ Choice Awards 2016 and 2017. Founded in Santa Cruz in 2011, Blue Lace Photography specializes in classic, clean, natural wedding photography for the modern couple who desires a photojournalistic approach. Engagement packages start at $600 while wedding packages start at $3,500 and include a complimentary engagement session, USB drive of edited high-resolution images, online gallery, and a second photographer. Albums and print products can be purchased separately. Photos are delivered within six to eight weeks of the wedding date. Blue Lace Photography has earned five-star overall customer ratings on both Facebook and Yelp. Clients say this photographer has an amazing vision and is easy and professional to work with. Carlie Statsky Photography is devoted to telling people's stories in an honest and creative way. This studio specializes in wedding and portrait photography. They are based in Santa Cruz, California and are willing to travel long distances to accommodate their clients. Carlie Statsky has a BA in photojournalism, and her photography style is inspired by the storytelling techniques of both fine art and photojournalism. Carlie works in a team alongside her husband, Gabe, a fellow photographer and artist. They have been shooting weddings together for nearly a decade, and they have a passion for documenting the story of each of wedding from a range of perspectives. Clients have been impressed by Carlie's reliability, friendliness, and her joyful passion for her work. Chris Brodell Photography is managed by Chris Brodell, a San Francisco Bay Area-based photographer who specializes in wedding photography. Additional service areas include all of Santa Cruz County and beyond. All weddings are capture in a natural and candid documentary style. Packages start at $2,250, which includes but not limited to two photographers, an online client gallery, and access to edited high-resolution images. Chris Brodell Photography portrait sessions use natural light portraits and the beautiful sights of Santa Cruz, a setting enjoyed by many clients. Clients have the option of checking availability or schedule a session using an online contact form. Covello & Covello Photography is a premier portrait studio located in Santa Cruz, California. Having begun over 75 years ago, the studio is a longstanding establishment well known in the area for a variety of photography including modern weddings to historical images, which are featured in Santa Cruz Sentinel every week. The team of professional photographers is available for multiple types of occasions like weddings, families, professional head shots, conferences, camps, engagements, pets, holidays, and more. Images from all sessions are retouched and finished by a team of qualified technicians and artists to create high-quality images and can be printed on site. The many past clients speak highly of their experience, patience, flexibility, and attention to details. Hayley Anne Photography specializes in wedding and engagement shoots and is based in Santa Cruz, serving much of the California area as well as Hawaii, Washington, and Oregon. Hayley’s work is rooted in simplicity, naturalness, and elegance. She’s been committed to professional photography for the past decade and has international photography experience after backpacking through over 10 countries in Europe. As a photographer Hayley likes to focus on the reactions and interactions between people and let personalities guide the portraits. Her work has been showcased in more than a dozen bridal blogs and magazines and past clients speak highly of her thoughtfulness and talent for taking quality pictures. Since 2008, Jennifer Webb has used a background in photojournalism and portraiture to capture life’s moments for the Santa Cruz, CA area. For twenty years, Jennifer’s passions have been photographing people and nature. Kane Photography offers senior, maternity, newborn, family, pet, and wedding portraits. Jennifer’s husband, Jason, works with her as a second photographer. They are available for location shoots, but will also make house calls for newborn portraits. Former clients speak consistently of Jennifer’s and Jason’s ability to make everyone comfortable, their professionalism, and the quality of the final product. Prospective customers may visit the Kane Photography website to view Jennifer’s and Jason’s portfolio and read customer reviews. New Perspective Photography is a renowned, full-service studio that offers an extensive range of services and capabilities for almost any customer’s personal or professional needs. 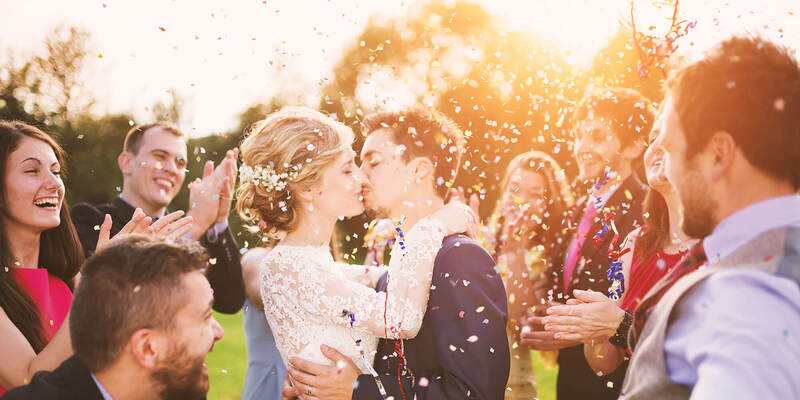 The studio’s owner is a world-class photographer and has the latest equipment and endless talent to make any wedding look like a star-studded gala from beginning to end, whether customers are planning a luxurious celebration at their favorite vineyard or a quiet and intimate wedding at the beach. Proposals, engagements, and weddings are some of life’s most exciting and dramatic events, so the photographer takes extra care to help make each session as comfortable and fun as possible so customers can relax and enjoy the moment. New Perspective Photography also specializes in real estate, landscape, and drone photography, all with a stunning, colorful, and editorial style. New View Photography has been photographing weddings in Santa Cruz and the Monterey Bay area since 1998. New View has the experience and professionalism to capture clients' special days just the way they envision them. New View Photography has shot hundreds of weddings, from large-scale events to small, intimate gatherings. New View Photography's packages range from a la carte options to full wedding coverage. New View has options for multiple-hour shoots, online proofing of images, client selection of enlargements, a 24-page wedding album, engagement sessions, and parent albums. New View Photography is happy to work with clients to determine the option that best fits their budget. Rebecca Stark Photography is a photography business in Santa Cruz, California. Photographer Rebecca Stark became passionate about photography when she was a child because her father was a photographer and her mother was an art teacher. Rebecca Stark Photography specializes in headshot photography, wedding photography, and portrait photography. Their wedding photography services include engagement, elope, indoor and church weddings, outdoor and beach weddings, ranch weddings, winery weddings, and destination weddings. The portrait photography services they offer include senior portraits, headshots, and family portrait. Rebecca Stark Photography is a recipient of the 2015 “People Love Us On Yelp” award and has been recognized as the 2015 Good Times Best of Santa Cruz Runner-Up. Rebecca Stark Photography also won the Wedding Wire Couples’ Choice Awards in 2015. Located in Santa Cruz, California, Sandra Ivany Photography has been providing fine art wedding photography services in the greater Santa Cruz and Monterey Bay areas since 2002. Sandra Ivany graduated Boston Museum of Fine Arts School and utilizes a contemporary photojournalistic style to deliver artistic images personalized for each client. As a professional photographer for more than twenty years, she specializes in destination weddings, elopements, and intimate outdoor events that highlight the beauty of the northern California coastal environment. Sandra is a member of The Wedding Professionals Networking Group, has worked on assignment for Hitachi, Intel, Crabtree & Evelyn, and Sheraton Hotels, and Coastal Living, Sunset, House & Garden, Life, and New York Times Magazine have featured her work. Splashes of Time Photography, based in California, is a professional photography service provider that covers wedding events. Clients have two options when it comes to the choice of photographer. Either they can choose the owner and master photographer Eric, or they can choose one of their senior photographers to be the primary photographer for the event. The complete wedding package comes with eight to ten hours coverage, and every package comes with professionally edited images, online galleries, and complete ownership of high-resolution images. In addition to photography services, Splashes of Time also specializes in videography. Interested clients can just call to book an appointment. Susan Helgeson Photography is a visual storyteller in Santa Cruz that documents weddings in the San Francisco Bay Area. The company captures moments of bliss and hope in the most “naturally romantic” way, and it has the technical resources to make heirloom pieces of these. The establishment owner and namesake, Ms. Susan Helgeson, is a Professional Photographers of America member and has more than two decades of industry experience, and she is a recipient of several WeddingWire awards. Susan Helgeson Photography also crafts portraits of individuals, families, and groups of like-minded people, and it offers different packages to suit the needs of each client. The shop welcomes requests for shoots outside of the county, and its website contains the current rates, payment information, digital archiving policy, and Susan’s claim to copyright of the images. Terry Way Photography is a Santa Cruz wedding photographer working throughout the Bay Area and Central Coast. Worldwide travel is available upon request. Terry Way emphasizes customer service and works to produce top-tier images that display emotion while looking natural. Clients find him accommodating and punctual. Specialties include weddings, engagements, portraits, and commercial photography. Terry Way Photography is highly qualified with over 20 years of experience. Full Service Wedding Packages begin at $2800 and feature customizable options. Complete packaging details are available by email or phone. Terry Way Photography offers weekday and weekend appointments to meet clients. Skype and phone consultations are available for those living out of the area. The Art of Emotion studio is owned and operated by Bucky, Erica, and Joshua Burgin who have been working together for nearly two decades in the San Francisco area. They are award-winning photographers who offer wedding and portrait photography. The Art of Emotion was listed on 2014 Photography Masters of Wedding and Portrait Photography International. While they specialize in weddings, they also offer engagements sessions, maternity shoots, baby portraits, family photos, and other special event photography. They also received The Knot’s Best Of Wedding Photography Award in 2012. Their services also include a password-protected gallery for viewing images and a CD with high-resolution images. Tim Cattera is a photographer who specializes in family portraits, indoor/outdoor locations, and landscapes. He takes pictures out of Santa Cruz with an eye for the San Francisco Bay Area and a passion for baseball. In fact, Tim works as the team photographer for the minor league organization San Jose Giants. He has also taken professional photos for the Santa Cruz Warriors basketball team, and he has more than 17 years of experience doing sports photos and action shots. Area restaurants have sought out Tim for food and drink photography for their menus and websites. He has received publication credits from the San Francisco Chronicle, various NBA websites, LAX Magazine, and MTV Music, to name a few. Clients in and around Santa Cruz, the Monterey Bay area, and the greater San Jose metro area can turn to the services of Tim Clinton Photography for their portraiture and wedding photography needs. Tim’s photographs blend traditional techniques, natural storytelling, and a creative eye to make each picture unique to the occasion. He likes to record candid, fun, and intimate moments for his customers to treasure forever and works to make people feel at ease during the sessions by creating a low-key, laid-back atmosphere. The photographer works exclusively on location and offers professional engagement, wedding, family portrait, and event photography.